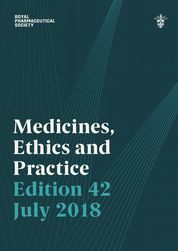 Medicines, Ethics and Practice: The professional guide for pharmacists is the Royal Pharmaceutical Society's established professional guide. Medicines, Ethics and Practice: The professional guide for pharmacists is the Royal Pharmaceutical Society's established professional guide for pharmacists. This 42nd edition is a revised practical resource which helps pharmacists practice confidently and professionally. It embeds professionalism at the heart of decision-making processes and provides essential information, supporting the pharmacist in their day-to-day practice.